Canine Aortic Endothelial Cells (CnAOEC) from Cell Applications, Inc. provide a useful model to study cardiovascular diseases and test potential therapeutic agents, not only important from a veterinary perspective, but also having implications for human health. Anwar, S., T. Yanai, and H. Sakai. 2016. Overexpression of Peroxiredoxin 6 Protects Neoplastic Cells against Apoptosis in Canine Haemangiosarcoma. J Comparative Pathol, 155:29-39. González-Miguel, J., C. Larrazabal, D. Loa-Mesón, M. Siles-Lucas, F. Simón and R. Morchón. 2016. Glyceraldehyde 3-phosphate dehydrogenase and galectin from Dirofilaria immitis participate in heartworm disease endarteritis via plasminogen/plasmin system. Veterinary Parasitology, 223:96-101. Roshan, A., L. Dong, C. Alvan, J. Bart and H. Wenhu. 2016. Validation of Cross-Species Reactivity of the VEGF-A/PDGFRβ Bifunctional Antibody PF-06653157. J Ocular Pharmacol & Ther, 32:650-658. Swancutt, L. 2016. Single high dose irradiation: applicability of cell survival curve modeling and in vivo evaluation of tumor biologic response. PhD Dissertation, Colorado State University. González-Miguel, J., R. Morchón, E. Carretón, J. Montoya-Alonso and F. Simón. 2015. Can the activation of plasminogen/plasmin system of the host by metabolic products of Dirofilaria immitis participate in heartworm disease endarteritis? Parasites & Vectors, 8:194. González-Miguel J, R. Morchón , M. Siles-Lucas, and F. Simón F. 2015. Fibrinolysis and Proliferative Endarteritis: Two Related Processes in Chronic Infections? The Model of the Blood-Borne Pathogen Dirofilaria immitis. PLoS ONE 10(4): e0124445. González-Miguela, J., R. Morchóna, M. Siles-Lucasb, A. Oleagab, and F. Simóna. 2015. Surface-displayed glyceraldehyde 3-phosphate dehydrogenase and galectin from Dirofilaria immitis enhance the activation of the fibrinolytic system of the host. Acta Tropica, 145:8–16. Heishima, K., T. Mori, Y. Ichikawa, H. Sakai, Y. Kuranaga, T. Nakagawa, Y. Tanaka, Y. Okamura, M. Masuzawa, N. Sugito, M. Murakami, N. Yamada, Y. Akao, and K. Maruo. 2015. MicroRNA-214 and MicroRNA-126 Are Potential Biomarkers for Malignant Endothelial Proliferative Diseases. Int J Mol Sci, 16:25377-25391. Heishima, K. T. Mori, H. Sakai, N. Sugito, M. Murakami, N. Yamada, Y. Akao, and K. Maruo. 2015. MicroRNA-214 Promotes Apoptosis in Canine Hemangiosarcoma by Targeting the COP1-p53 Axis. PLOS One, DOI: 10.1371/journal.pone.0137361. Swancutt, K. 2015. Single high dose irradiation: Applicability of cell survival curve modeling and in vivo evaluation of tumor biologic response. PhD Dissertation, Colorado State University. Osterbur, K., D.-H. Yu, and A.E. DeClue. 2013. 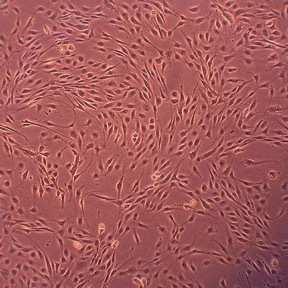 Interleukin-1β, tumour necrosis factor-α and lipopolysaccharide induce C-type natriuretic peptide from canine aortic endothelial cells. Research in Veterinary Science. 94:478-483. Baumgartner-Parzer, S.M., F.R. Waldenberger, A. Freudenthaler, A. Ginouvès-Guerdoux, D. McGahie, and H. Gatto. 2012. The Natural Antioxidants, Pomegranate Extract and Soy Isoflavones, Favourably Modulate Canine Endothelial Cell Function. ISRN veterinary science. 2012: doi:590310.595402/592012/590328. Monginoux, P. H. Gatto, C. Karst, and F. Waldenberger. 2012. Products for oral administration comprising extracts of punica granatum (pomegranate), intended for a pet, and applications of same. Patent Application US 20140335180 A1. Murai, A., S. Asa, A. Kodama, A. Hirata, T. Yanai, and H. Sakai. 2012. Constitutive phosphorylation of the mTORC2/Akt/4E-BP1 pathway in newly derived canine hemangiosarcoma cell lines. BMC Veterinary Research. 8:128. Osterbur, K. 2012. The mechanism of C-type natriuretic peptide production in dogs and its use as a prognostic indicator in critically ill dogs. University of Missouri, MSc dissertation. Boilson, B.A., K. Larsen, A. Harbuzariu, S. Delacroix, J. Korinek, H. Froehlich, K.R. Bailey, C.G. Scott, B.P. Shapiro, G. Boerrigter, H.H. Chen, M.M. Redfield, J.C. Burnett, Jr., and R.D. Simari. 2010. Regulation of circulating progenitor cells in left ventricular dysfunction. Circulation. Heart failure. 3:635-642. Wills, T.B., A.M. Heaney, K. Jane Wardrop, and G.J. Haldorson. 2009. Immunomagnetic isolation of canine circulating endothelial and endothelial progenitor cells. Veterinary Clinical Pathology. 38:437-442.